We were so excited when we were given permission by National Parks to establish our Pembezoni Luxury camp inside the Wilderness Zone of the Serengeti National Park. Totally wild ground, untouched for more than half a century. 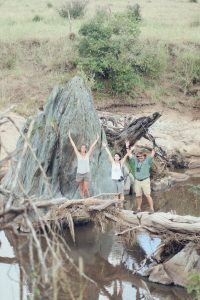 We had explored the area by car and on foot during Easter and identified a great spot a little way form the river near a huge fig tree so heading back last week we were looking for these same landmarks. The challenge was not to be distracted by all the wildlife in the area – we came across a pride of lions with fat bellies and big smiles about 200 metres from camp, then later, after tents were marked out a group of three male buffaloes charged through the centre of the site. Neither were threatening experienced, I think they just wanted us to know that we were in their domain! 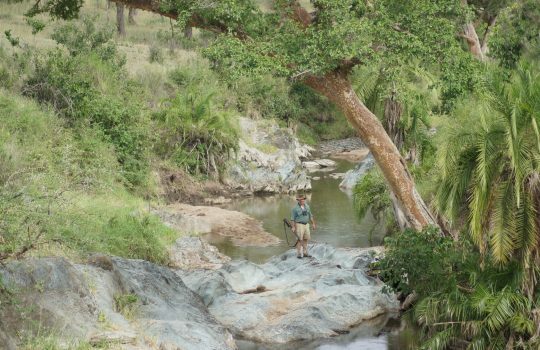 On that first day we set our own small tent up on the edge of the site and just absorbed the feeling of peace and serenity; except for the troop of baboons who spent the night in a nearby acacia tree and seemed to squabble all night long! In thinking about where to put the mess tent, where to put all the sleeping tents, the kitchen and staff tents – where to have the approach road to cause least disturbance. Where we would put the solar panels to get most sun but the shortest wire run, how far apart to put the tents to give a sense of space but not so far that it was a long hike to the lounge tent and campfire, such a fantastic opportunity to have a blank canvas! Special campsites from National Parks are usually all set up so it felt like a huge privilege to be able to create the perfect camp! As the sun dipped we lit a campfire and started cooking dinner and cracked a cold beer. Sitting back listening to the lions roar back and forth with the Milky Way glowing like a superhighway across the heavens…….